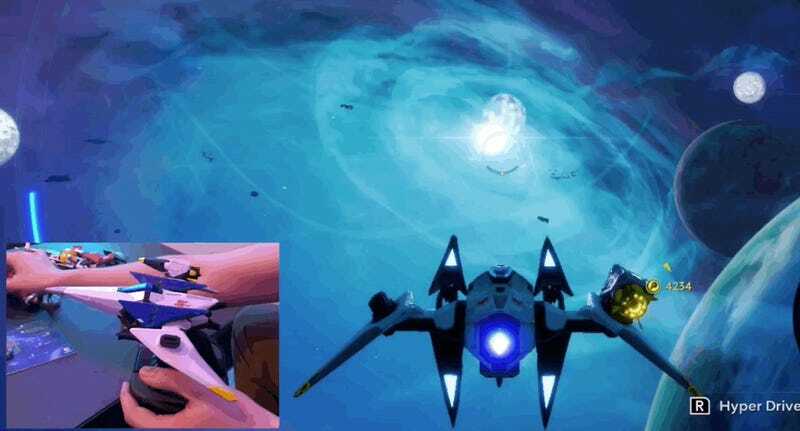 We’ve got video atop this post that shows the game in action on Switch and on an Xbox One X. We’ve even got some fancy picture-in-picture to show how the pilot and spaceship toys that are being offered with Starlink manifest in the game. The main gimmick here is that you can assemble and customize ships and see those ships take shape in the game as you do. Pull off a wing, and the wing comes off in the game. Turn the wing around and put it on backwards, and it goes on backwards in the game. Unsnap a cannon, replace it with a flamethrower, and those usable weapons change in the game. Players can snap on weapons and wings as they customize the game’s ships. All these items can be purchased digitally if players prefer that. The October 16 game seems like Ubisoft Toronto’s riff on No Man’s Sky, with the huge caveat that it’s hand-made, unlike Hello Games’ procedural adventure. Players fly spaceships through space, then rocket seamlessly to the surface of beautiful planets, where they encounter systemic ecosystems of creatures. You can fly over the surface of these planets or go into a hover mode so that it has more of the feel of a third-person action game, with a focus on blasting enemies with your ship’s weapon. It’s a game still designed and priced on that toy-game model. Starter packs come with starter pilots and ships. More are sold separately. If your ship goes down, you can resume without restarting if you have a spare ship, which clearly incentivizes you to either play better or buy more ships. The PS4 and Xbox One versions include one starship, one pilot, and three weapons. The Switch version has the Arwing, Fox McCloud, a second pilot, four weapons and some exclusive Star Fox mission stuff. Other packs of more ships, weapons and pilots are sold separately.